HS Diving @ McCallie Invitational. Meet is at 5:00 PM EST. HS Swimming @ McCallie Invitational. Meet is at 8:00 AM EST. Congratulations to our 2019 Tennessean All-Midstate Boys and Girls Swimming Team Selections! Kallie Chelsvig '20, state champion in the 100m freestyle and verbal commit to Notre Dame, made the All-Midstate team in the 100-yard freestyle. And in the boys' category, behind Coach of the Year Christian Bahr, Evan Petty was named 200 yard IM and 100 backstroke. The Ensworth boys filled the entire All-Midstate relays teams, the 200-yard medley, 200-yard freestyle, and the 400-yard freestyle. The Boys' Swimming and Diving team finished in 4th place at the State Tournament. The Tigers finished 3rd in the Boys/Girls combined. The Girls' Swimming and Diving team finished in 5th place at the State Tournament. The Tigers finished 3rd in the Boys/Girls combined. Christian Bahr is the Head Swimming and Diving Coach at Ensworth. For more than 30 years, he has competed, coached, or covered every level of swimming and diving, from age group swimming to the Olympic Games. Coach Bahr started swimming year-round when he was eight. He went on to swim in high school and college, where he was an NCAA All-American and multi U.S. Nationals finalist. Coach Bahr represented the United States at the 1997 World University Games. Coach Bahr came to Ensworth in 2012 after more than a decade of coaching with The Bolles School and Bolles School Sharks in Jacksonville, Florida. His swimmers have: set state and national records, made the U.S. National Junior Team, qualified for U.S. Olympic Trials, and swum in the Olympic Games. Coach Bahr has coached on deck at meets ranging from local club meets to Olympic Trials and the 2012 Olympic Games as a coach with Brunei Darussalam. 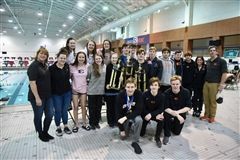 Most recently, in addition to coaching at Ensworth's High School, he served as an assistant coach with Nashville Aquatic Club.